We are afraid to inform you that there was our mistake in the previously published paddock layout, and we are publishing revised layout (ver. 2). Crews and team personnel, please make sure to obtain this version. Paddock layout is published,and available for download from the link below. Entry list is published,and available for download from the link below. Rally Guide 2 is published,and available for download from the link below. Itinerary Ver.2.01 is published,and available for download from the link below. Nippon Rent-A-Car is an official rent-a-car company for the Rally Hokkaido. 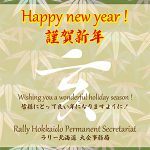 There is a special website set up for the participants and officials of Rally Hokkaido to enjoy their special offer. Supplementary regulations is now published.